Lately, there's been roasted cauliflower. I tend to throw the blame toward anything but my own laziness when I've hit a slump of sorts. I haven't been cooking lately. I haven't been writing lately. I haven't even been taking pictures of anything lately. In the past, I've pointed the finger toward the weather, or wedding planning, or busy weekends away. Today, I blame my kitchen. My lease ends on July 31, and ever since I decided not to re-sign, my apartment has become a disaster area. "What's the point in cleaning?" is my reasoning -- "I'm just going to pack it up anyway." Ha. Well, it's probably no surprise then that my kitchen is just plain filthy, not to mention windowless and dark and tiny and I only have one drawer about 8 inches wide and the floor tiles are ancient and I am so ready to move out. It's really tough to cook in an unappealing space. A kitchen should be bright, inspiring, happy. A place to escape and unwind and create. Usually, I can make do. But lately? Not so much. No, lately I'm lucky if I can get myself in the kitchen long enough to chop a head of cauliflower, drizzle it with olive oil, and stick it in the oven for half an hour, only to scurry back to the couch for the next "Lost" episode on DVD. And maybe cooking can't quite get me back in the kitchen, but eating certainly can. When a pan of roasted cauliflower, sprinkled with shredded Parmesan cheese and a generous squeeze of lemon, sits cooling atop the off-balance ranges on my stove, I find my way back, again and again. I am a strong believer that lemon makes almost everything better, and cauliflower is no exception. I first made this dish on Thanksgiving, and the fresh lemon was a perfect complement to the rich casseroles and gravies. I made it again and offered some to Murdo, who confidently declared, "I'll try it, but I won't like it." Add cauliflower to the list of vegetables I got the self-proclaimed veggie-hater to love. Preheat oven to 400. Spread the florets on a baking pan and drizzle with enough olive oil to coat each piece. Sprinkle with black pepper and place in preheated oven for 30 minutes. 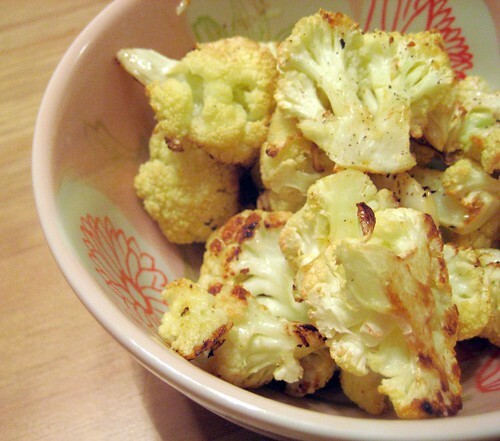 When cauliflower is golden brown, remove from oven and sprinkle with lemon juice and Parmesan cheese. Let cool. I ate mine in a big bowl with scrambled eggs, then wandered back to the kitchen a few more times to pick at the leftovers. Yes, this roasted cauliflower is one of those dishes. First of all, you like LOST too? How have we not discussed this? I am its biggest fan. HUGE. Also, big bummer about the kitchen issues - I would be the same way. I hope things are getting worked out as for what you'll be doing come 7/31? Moving? Staying? I'll be anxious to hear, at least. And one more thing - if you do end up staying, we should see Julie & Julia. What do you think? It comes out in the beginning(ish) of August, I think. shanna - just started watching lost on dvd and i'm hooked! i'm only on season 2 so don't tell me anything! also, yes! i'm in for julie & julia. Your poor kitchen. Glad to hear you're fighting your way through, one cauliflower at a time. 190.arch - awesome, thanks! you'll love it. i loveeee cauliflower! i like to moosh it up to make a lighter mashed potato type deal. like your picture, the citrus sounds great, i'll have t try! Leno's Submarine Sandwiches in Waukegan.